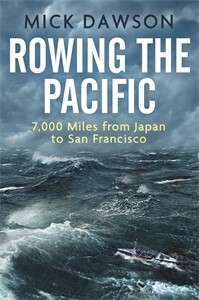 The thrilling story of Mick Dawson’s most challenging rowing feats in the open ocean, culminating in his greatest achievement: rowing 7,000 miles across the North Pacific Ocean, from Japan to San Francisco. In the wake of the bestselling Boys in the Boat film, and Discovery’s documentary on Dawson’s epic voyage, this is a nail-biting story of man versus nature. Storms, fatigue, equipment failure, intense hunger, and lack of water are just a few of the challenges that ocean rower Mick Dawson endured whilst attempting to complete one of the World’s ‘Last Great Firsts’. Former Royal Marine commando Dawson, a Guinness World Record-holder for ocean-rowing and high-seas adventurer takes on the Atlantic and ultimately the North Pacific. It took Dawson three attempts and a back-breaking voyage of over six months to finally cross the mighty North Pacific for the first time. Dawson and his rowing partner Chris Martin spent 189 days, 10 hours and 55 minutes rowing around the clock, facing the destruction of their small boat and near-certain death every mile of the way, before finally reaching the iconic span of San Francisco’s Golden Gate Bridge. Dawson’s thrilling account of his epic adventure details how he and Chris propelled their fragile craft, stroke by stroke for thousands of miles across some of the most dangerous expanses of ocean, overcoming failure, personal tragedy and everything that nature could throw at him along the way. MICK DAWSON is one of the most experienced and successful ocean rowers in the world. To date, he has spent over 440 days at sea in rowing boats, covering a distance of over 18,000 nautical miles. He is a former Royal Marines commando, who saw active service both in the Falklands War and the Middle East. His lifelong passion for the ocean continued after his time in the Royal Marines when he went on to become a professional sailor and ultimately record-breaking ocean rower. He is currently working with veterans on maritime projects to assist with their recovery from PTSD and combat injuries. Mick Dawson is available for feature and interview.